I attended the NEHGS Fall Weekend Research Getaway – Breaking Through Brickwalls this weekend. I got on the commuter train Thursday morning very excited. 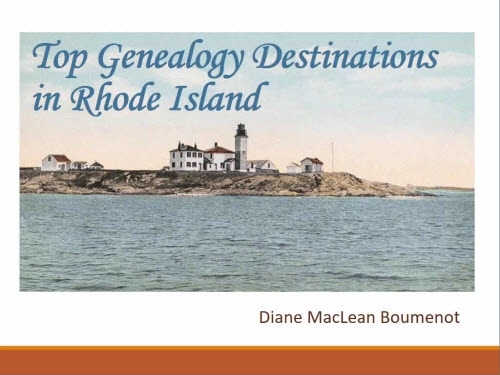 Although I didn’t know anyone that would be there, any roomful of genealogy enthusiasts is a great place to be, so I wasn’t worried about that. 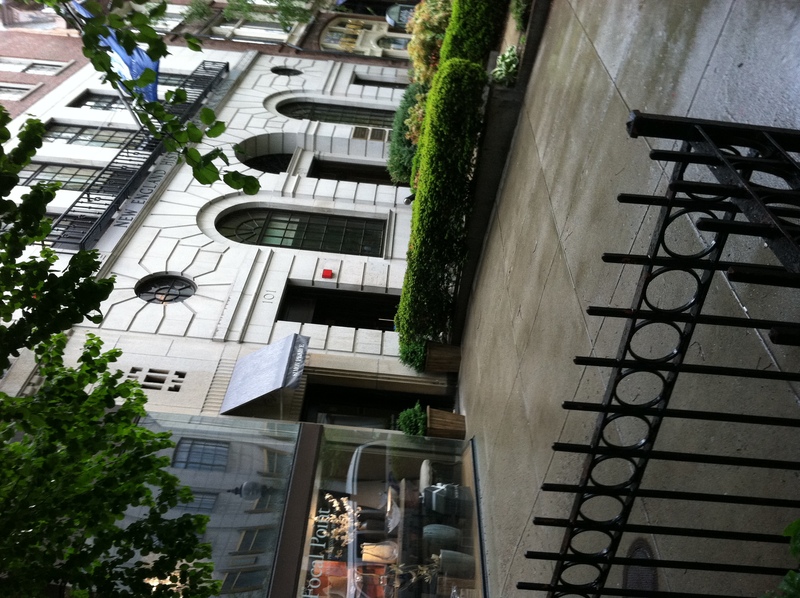 Aside from the few talks, which looked great, I was pleased with the opportunity to have the research areas I had mailed in a few weeks prior discussed with someone from the terrific staff of NEHGS. I also gathered my documentation of five problems into a notebook. When I arrived I went up in the elevator with another attendee and Gary Boyd Roberts. He had an armful of papers and asked us our names, then fished out the research summaries we’d submitted earlier, which now had his handwritten notes all over them. If I’d been able to read his handwriting, I suspect the notes would have been incredibly useful. After an initial talk and library tour, I had a meeting with one of the archivists. That got me on track with some further searching on two problems and that took the rest of the day. She explained some slow steady work that was needed to narrow down one of my problems and also pointed out a few special Connecticut resources. At another session I was told to check a CT church record index on microfilm, and given some tips about, for instance, exploring WHY the minister on a certain marriage record was from another town. Oops, tracking down details that don’t fit … guess I forgot that! We all had hope of getting some concentrated attention from Gary Boyd Roberts during our three day stay. None of that had been guaranteed or even mentioned, so I don’t want to give the impression it was officially on the program. He asked that we bring paper genealogies. I arrived home the first night at 8 p.m. and began printing. They say in addition to helping you build, he will also ruthlessly chop off sections that he doesn’t trust. “Gary giveth, and Gary taketh away” is how it was put. 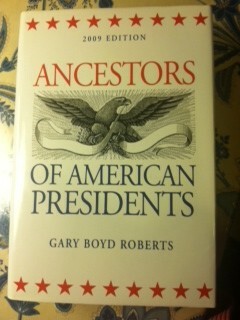 I debated whether to bring my copy of Ancestors of American Presidents for him to sign should we end up talking. I’m only related (distantly) to Garfield and Taft. Surely that is enough of a disappointment and he’ll take pity on me and sign the book. Or not. So on day two, the first thing that happened was that Gary Boyd Roberts was ready to look at my tree. It was an amazing hour and a half. Of the five brick walls I brought with me, he actually solved one and gave me advice on all the rest. He was also interested in the earlier branches of my tree and gave me lots of insight into those early families. One, the Goddards, have royal lineage and the same is true of the Wheelers. My Dwights are probably related to the Dwights of Yale U. My Baldwins may be from Woburn, Mass. He and I share the Whitings. We walked back into the stacks a number of times and he reviewed the books that might be useful to me. If the books contained recent photos, copies of documents, snippets of any kind, really, he dismissed them as “scrapbooks” (which I came to realize was his ultimate insult) but sometimes suggested I consult them anyway. When we came to my Arnold problem he told me that the author of The Arnold Family of Smithfield, Rhode Island was in the library and he would ask him what he thought. So there I sat as the two of them discussed Lucy Arnold. My guess for her identity was approved, so I will continue to look for some proof of that. Don’t get the impression that I explained any of my problems to him. Gary Boyd Roberts looks at your tree and HE tells you what your problems are. In the end he graciously signed my book and went off to help the others. Later, when we all had dinner, we sat together. I truly admired his devotion to the needs of every participant. He wasn’t just phoning it in, he completely concentrated on each person’s tree – often for hours – and gave some incredible advice. The problem that got solved for me was the Nancy Tefft problem. He found a bad photocopy of a badly organized old book that gave the answer. I then easily found some probate evidence. I learned an awful lot about every branch. I was left with a lot of copying to do, microfilm to check, manuscripts to request, and indexes and journals to check. My method was to photograph each page without flash, then print them at home (there were 235 pages), and also store the photos. This took the rest of the day and the next day. I still need to analyze all that evidence. It is a unique and sort of terrifying experience to have your tree examined by Gary Boyd Roberts. And AWESOME!! The other attendees were great and I hope to see them again. They were at all levels but had the same quality of intensity. We had many wonderful conversations about the work we were doing. The weekend made me value my NEHGS membership and realize that I need to get up to the library regularly, maybe once a month. It was probably the three most productive days I’ve had in genealogy. And thanks to my breakthrough I have a whole new branch to explore. I’ve only been to the NEGHS once. I prepared pretty carefully for my pilgrimage, took the train into Back Bay Station, walked a few blocks and there I was, standing in front of the brass doors. I even took a picture. Sure, I learned some interesting things that day. 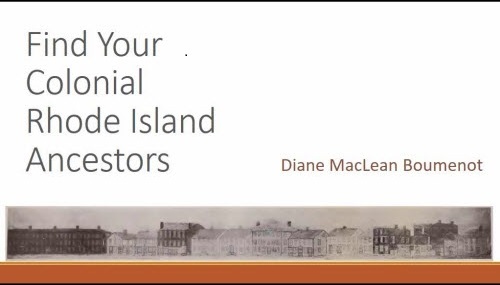 I found a deed on microfilm from Cumberland, Rhode Island that was helpful. I read some journal articles of interest. I wasted time in the printed genealogy section … it’s hard to leave the stacks. I enjoyed the lobby display of current publications and found a book about the Arnold family that I had not been aware of. I bought it, and on the train ride back discovered that there was a mistake in my Arnold line and I need to do further research. But let’s get back to what I saw. 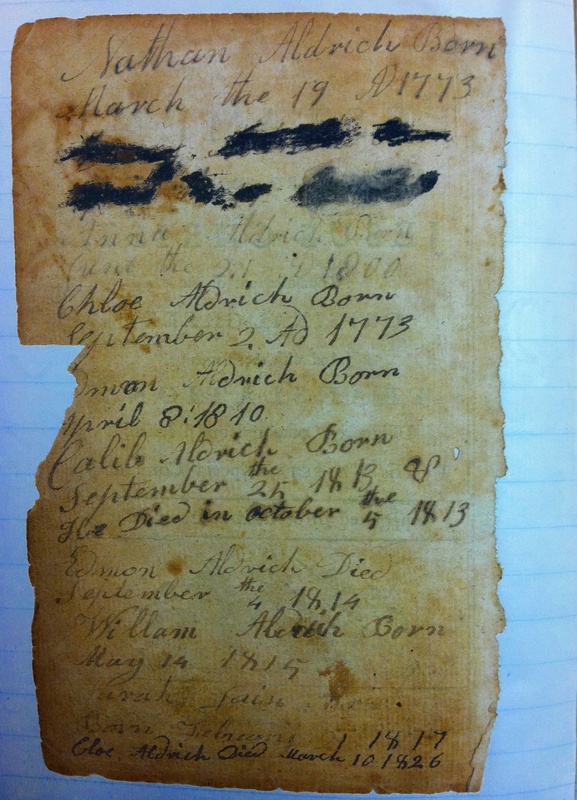 Chloe Aldrich Died March 10, 1826. Wait … who are these people? Nathan is buried between his second and third wives in Wrentham, Mass. At the Burnt Swamp Road Cemetery in the Sheldonville section of Wrentham, Mass., Nathan is buried between wives number 2 and 3 (who I believe were cousins to each other). There is some normal documentation of those two marriages. Of course the poorly documented marriage is the one I’m descended from; Mercy is my ggggg-grandmother and Nathan is my ggggg-grandfather. I am ANNA’s descendant. I had gotten my first faint evidence of the Mercy/Nathan marriage in an old Ballou genealogy. But when I found this Bible entry it left me with a lot of questions about Mercy. Why wasn’t she on the list? Why wasn’t she in the cemetery? Whereas Marcy, wife of me the subscriber, hath separated herself from me and at sundry times has unnecessarily run me in debt: These are therefore to forbid all persons trusting her on my account, as I am determined to pay no debts of her contracting from the date hereof. 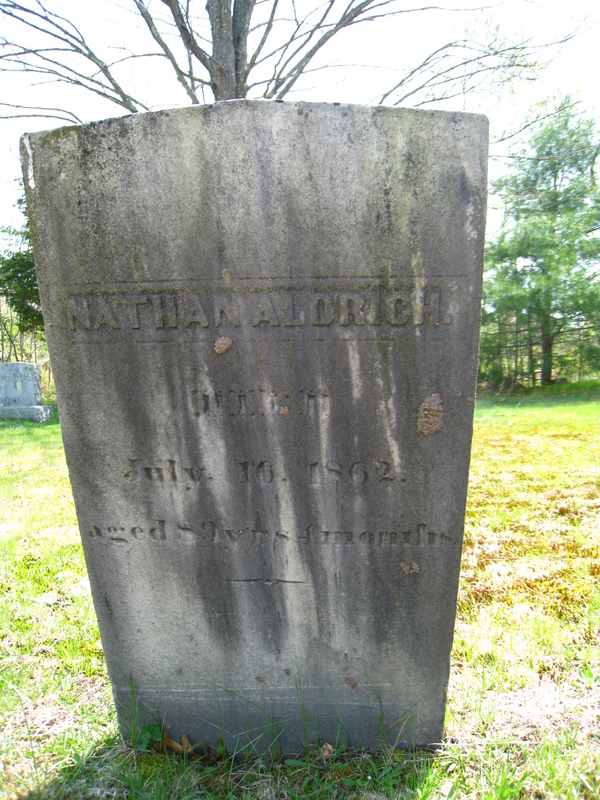 NATHAN ALDRICH, Cumberland, May 5, 1802. I have not discovered a death or divorce record for Nathan and Mercy. I don’t know what happened to her. However Nathan and Nancy (“Anna”)’s relationship was, I believe, eventually repaired. A few years later she married a local boy, Paul Darling, and went on to have five children. Late in life, Nathan and third wife Lois were living with one of Nancy’s sons and his family on the family farm. And more than that we may never know. … what was in the Bible? The document turned out to be just the one leaf from the Bible, not the book itself. But I’m grateful that Mr. Foley rescued this from whatever book stall it ended up in in 1897. The archivist brought it over to me at a table. It was in a protective binder. At my request the kind archive lady came over and peered at the page from different angles with me. We agreed on what it said. 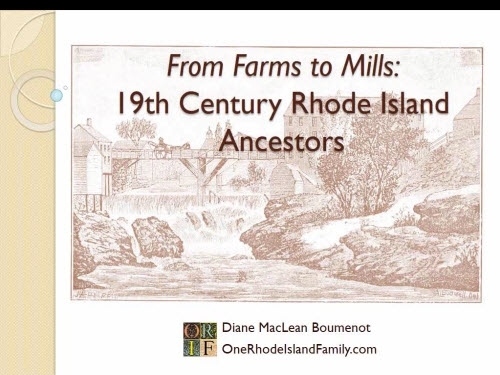 This offers the first real evidence for Mercy’s family and matches the theory I had gleaned from the old Ballou book and some Rhode Island birth records. She is the daughter of Richard and Lucy Ballou. I am grateful to the NEHGS for saving such an insignificant scrap. This part of my family is poorly documented and obscure. I have found no evidence that any other descendants of Nathan Aldrich are doing research. I would venture to guess that I’m the first person to request that archival record in the 114 years it’s been sitting there. And despite a little resentment about the “unbecoming behavior” remark, it meant a great deal to me to hold something in my hand that my ggggg-grandfather wrote in 1800.